Well, I’ve already seen it: as the days have gotten shorter (and rainier) this last week, the chorus of sneezes and coughs have begun. As we head into cold and flu season, remember that there are simple ways to beat it! The use of salt water rinses for the mouth and nose is probably the simplest and least expensive healthcare around. Bacteria and viruses can both be destroyed by salt water – the trick is to act at the first sign or suspicion of cold /flu. What To Do: Take ¼ to ½ teaspoon of salt and dissolve in room temperature or slightly warm water. Gargle for at least 30-60 seconds and spit out. Repeat a few times a day. For the nose: use a neti pot or saline spray (both are easy to find in the drugstore or grocery store). Continue for several days or longer if symptoms persist. 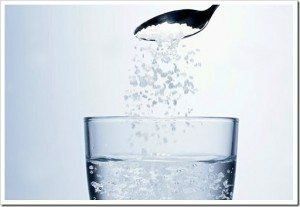 If you are already sick, remember salt water is still an effective tool. Gargling will help reduce throat inflammation, and rinsing your nose will flush out your nasal passages. Another key point for prevention is infection control. We touch our faces quite often without even being aware of it, and our eyes, nose and mouth are easy places for where bacteria and viruses can be transmitted. Make sure that you cough or sneeze either into the bend of your arm or into a tissue and wash your hand afterwards. Also make sure to wash your hands carefully throughout the day. If you’re in a pinch (i.e. not near a sink) hand sanitizer is an acceptable substitute. These points are simple but often are neglected as our day gets busier. Previous Post: Xylitol : How It Can Make This School Year Healthier For Our Children (and adults too)!